The Tidal Bore in New Brunswick Canada, occurs along the Peticodiac River near Moncton & Riverview and is a naturally occurring phenomenon that is caused by the surging waters from the Bay of Fundy tides which are the highest tides in the world, that roar up the Peticodiac River twice daily during the changing tides. 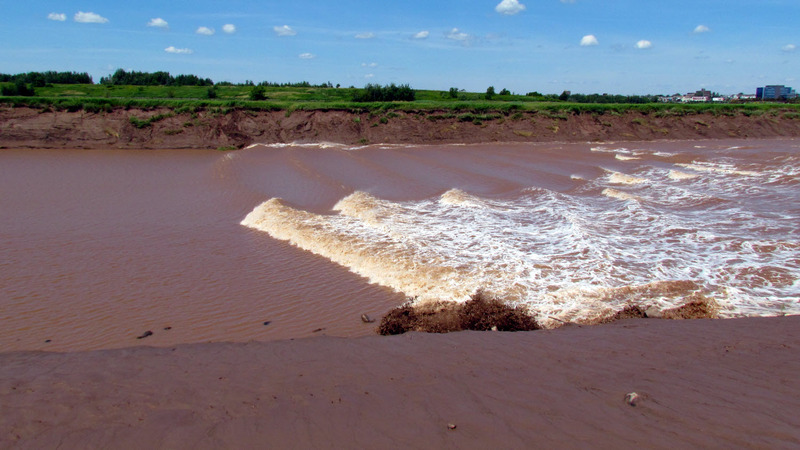 The Tidal Bore occurs twice per day and creates a thick wave of water from the higher waters in the bay Bay of Fundy which run up the placid Peticodiac River and roll back upstream in one wave, which can vary in height from 3 cm (1 in.) to 60 cm (24 in.). Just as spectacular is the rapid and dramatic change in the river itself. 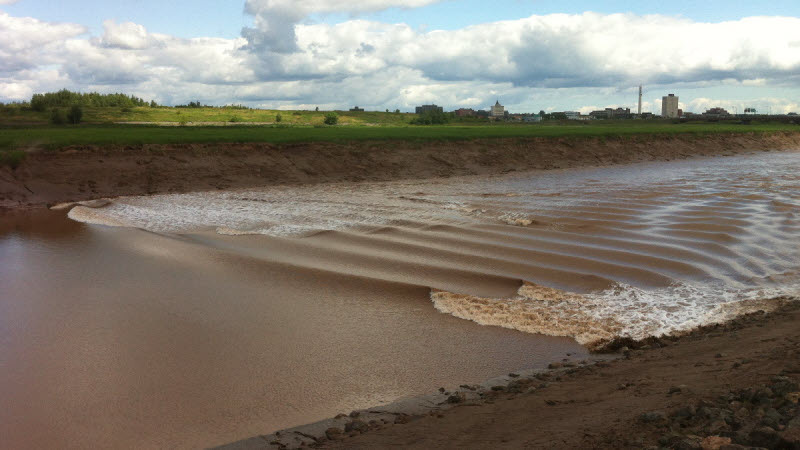 At low tide the muddy river bottom is often visible, but within an hour of the arrival of the Tidal Bore, the water level rises some 7.5 m (25 ft.), filling the river to its banks. Near full moons the tides are exceptionally strong which create very robust tidal bores that are amazing to witness and now surfers are enjoying riding the wave as it pushes up the Peticodiac River. Visit the local Visitor Information Centre located beside Bore Park in downtown Moncton for Tidal Bore arrival times. Other great viewing spots are on the boardwalk outside the Chocolate River Factory in Riverview or from the Gunningsville Bridge Bike and Walking Trail. Please note that the schedule is an approximate time of arrival. 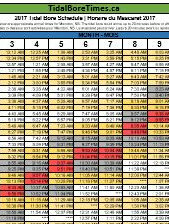 Depending on many natural factors, it can vary 15 to 20 minutes before or after the scheduled time. The Riverside Park along the Peticodiac in Riverview is a great place to watch the Tidal Bore. This picture on a hot day shows the white caps along the front edge of the bore. It makes quite a noise as it rushes over the stones and mud on the banks. There are some great viewing spots to catch a view of the tidal bore along the Peticodiac River as it comes in from the Bay of Fundy on the high tides. Probably the best known viewing spot is in Moncton where an outdoor seating grandstand has been built along the boardwalk trail that runs along the river. During the summer this is a great spot for photos and making videos of the tidal bore as it turns the bend as it passes Dieppe and heads towards the Moncton Information Center right beside the viewing area. Riverview, on the other side of the Peticodiac river from Moncton, also has fantastic viewing spots. The Riverfront Trail system runs along the river and the area between the Gunningsville Bridge and the Causeway is an ideal spot for a long viewing experience. The surging tidal wave first passes under the Gunningsville Bridge, hitting the cement pillars that support the structure with a big splash, and then rushes up past the Chocolate River Factory on the banks of the river where a large boardwalk viewing area with interpretive panels has been built. The tourist info center is also at the Chocolate River Factory so it's a perfect stop to park and watch the bore. Lots of parking here and the trail is awesome!